One aspect of lettuce that sets it apart from any other vegetable is that you can only have it one form, and that's fresh. There are hundreds of different varieties of lettuce and today, an increasing availability so that our salad bowls can contain a wealth of color and texture. Lettuce is rich in calcium, potassium, iron and vitamins A, E and C, along with traces of other elements. Keep in mind, the darker the leaves, the more nutritional value! Lettuce likes moist, fertile, well-drained soil and a sunny location. Plants grow quickly, make sure you supply ample watering and nutrients! We recommend fertilizing with either Master Nursery's Tomato & Vegetable Food 5-10-10 or E.B. Stone Organics Tomato & Vegetable Food 4-5-3 to ensure your best harvest. Another reason we love lettuce? They make a great alternative for annuals in pots! These are the classic lettuces seen in kitchen gardens. They have a pale heart and floppy, loosely packed leaves with great flavor as long as they are fresh. Crisp lettuces, such as Iceberg, have an excellent crunchy texture and will keep their vitality long after Butterheads have faded and died. These are non-hearting lettuce with lose leaves and include 'Lollo Rosso', 'Oak Leaf' and 'Red Salad Bowl' lettuces. This group of lettuce can really make a salad look colorful! Also known as "Cos", it is very upright and columnar, forming a creamy white, crisp heart, surrounded by sturdy outer leaves. Considered the most delicious lettuce, this has a firm texture and a faintly nutty taste. It is the lettuce for an authentic Caesar Salad. In appearance, Bibbs look like something between a baby Romaine and a tightly furled Butterhead. They have firm hearts and are enjoyed for their distinct flavor. Like other lettuce hearts, they cope well with being cooked. This popular winter leaf does not actually belong to the lettuce family, but as it makes a lovely addition to salads. Called mâche in France, it has spoon shaped leaves and excellent nutty flavor. Chard can take summer heat and not bolt as well as handle the cold just fine. With regular watering, chard will tolerate most garden soil. Leaves are picked as the plant grows, so one planting can be harvested over many months. Typically we count 30 days for baby leaves and 55 days for full size. Chard is highly ornamental, mix it in the flower garden for color and form! 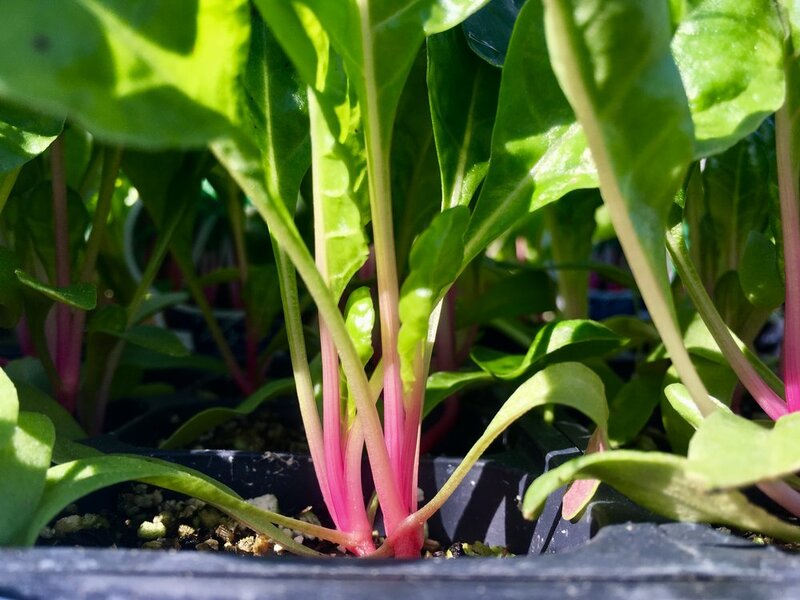 Did you know that chard is actually a kind of beet that grows edible leaves instead of roots? Cooking with it is easy; sauté, steam or braise with olive oil, garlic, pepper and salt. (Add anchovies for a nice kick!) Great to put in salads, soups, pasta dishes or omelets, we love to substitute it for spinach! Once cooked, it is also nice to layer into lasagna. Don't miss the 'Bright Lights' variety! It's vibrant, multi-colored stems and green to bronze leaves are lovely to look at and delicious to eat! Our 'Peppermint' variety (as seen above to the right) is a unique chard with thick, white stems striped in pink on back and hot fuchsia on front. With uniform, mildly savoyed dark green leaves, it's a great color for your salad mixes! There is still time to plant a number of winter veggies. Check out our guide on Growing Onions, Garlic & Shallot and our tips for spinach and peas here!